Clipper controls invasive floating and submerged weeds. It is great for treating problematic weeds such as watermeal. 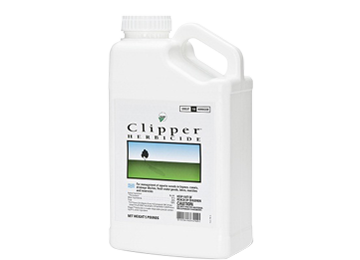 Clipper® aquatic herbicide eliminates invasive floating weeds and submerged weeds, such as duckweed and watermeal. It also treats a wide variety of algae. For a more complete solution to control watermeal, reduce the nutrients in your pond, and to control the algae, we recommend using additional pond weed control products along with clipper. * Due to low inventory of #1 Clipper, orders are limited to #1 per person. Clipper® aquatic herbicide is available in one pound containers that can treat up to a one acre pond and five pound containers that can treat up to a five acre pond when used in surface applications. Its quick dissolve granules mix well into the water eliminating messy application. Clipper® can also be pre-mixed with water and applied using a chemical sprayer. Clipper® delivers fast and selective control of tough invasive and nuisance plants such as cabomba, watermeal, Eurasian watermilfoil, water lettuce, duckweed, giant salvinia and more. Plus, Clipper® dissipates quickly from the water column and does not accumulate in sediment. Manufactured by Valent U.S.A Corporation. We have a 1 acre pond which was getting inundated with duckweed and watermeal. I bought a hose end sprayer for dry and water soluble product at the local hardware store which allows a greater area of coverage. I used only 8 ounces on my first and so far only application and after about 10 days the pond is clear. I can only access about 30% of our pond’s shoreline and it still rid the entire pond.